How many electrical design products have you see perform automatic electrical device layout? The answer is either one (if you have seen DraftLogic Electrical) or none! A few keystrokes and the entire drawing is serviced by lighting and receptacles. 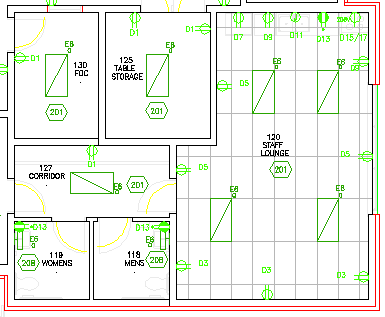 Once DraftLogic Electrical has placed objects based on the rules you decide for each room type, you can add objects, move objects, modify load and the other attributes of objects, or remove objects. See the Luminaire Placement page for detail on fixture placement automation. DraftLogic Electrical will place receptacles on walls based on user specified spacing requirements and/or by user-selected rules that place receptacles in relation to objects in rooms (like counters or desks) or content elements (like beside the doorway). See the Power Placement page for detail on receptacle placement automation. 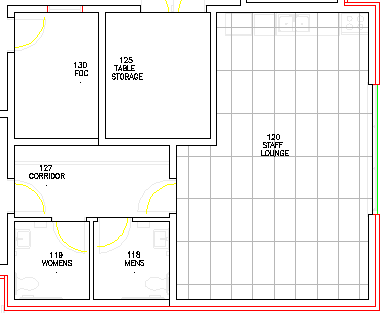 Above right we see a portion of a floor plan before DraftLogic Electrical Automated placement is run on the rooms. To the left, we see the lights and receptacles placed completely automatically during DraftLogic Electrical's Automated Placement function. The time taken for these six rooms to have these 50+ objects placed is mere seconds! In future versions, automated placement will support more and more systems. See the Other System Placement page for detail on additional systems support.